[시사뷰타임즈] 런던 서부, 래티머 로에 있는 아파트 단지에서 밤새도록 엄청난 불길이 맹위를 떨쳤는데 목격자들은 사람들이 자신의 집 안에 갇혀있다고 주장하고 있다. 랭캐스터 웨슷 이스테잇에 있는 그렌휄 타워라는 아파트 단지에서의 화재는 영국서머타임(BST) 시각으로 00:54(이하 영국서머타임)에 보고됐고 소방수들이 아직도 화염과 싸우고 있는 중이다. 런던 경찰은 사람들이 다양한 부상 상태로 치료를 받고 있는 중이라고 했다. BBC의 앤디 무어는 고층 아파트 전체에 불이 붙어있으며 건물 자체가 붕괴될 우려가 있다고 했다. BBC 특파원 사이먼 레더맨은 ‘상당히 많은 수의 사람들’이 어떤 상태인지 알 수도 상황인 것으로 안다고 했다. 이 아파트 단지에는 아파트나 연립 등 아파트식 건물이 124동 있으며 화재가 난 건 24층 짜리 아파트이다. 소방차 40대가 출동했으며 란던 시장 사딕 칸은 중요한 사건으로 선포됐다고 말했다. 04:00경, 경찰은 “해당 건물에서 주민들을 계속 대피시키고 있다”고 했다. 목격자들은 아파트 단지 꼭대기에서 번쩍하는 불빛 -휴대전화나 손전등이라고 생각되는-을 봤다고 말했다. 다른 사람들은 주민들이 -내부에 갇힌 것으로 생각되는- 창가에 다가 오는 것을 봤다고 말했다. 무인 수압 장치가 10층 옆면에 물을 쏘고 있는 중이다. 사이먼 렌더맨은 고층의 불길은 찹을 수가 없었다고 말했다. 그는 아파트 불타는 모습이 몇 마일 거리에서도 볼 수 있다며 10층 이상부터는 불길이 아무런 통제도 받지 않고 타오르고 있다고 말했다. 앤디 무어는 “건물에서 떨어지는 잔해를 보아왔으며 여러 차례 폭발하는 소리도 들었다. 유리가 깨지는 소리도 들었다”고 했다. 런던 소방서 부 서장 댄 댈리는 “소방수들이 불길을 잡기 위해 매우 어려운 조건하에서 극도로 힘들게 일하고 있는 중“이라고 했다. 위험 환경에서 생명구조 의료행위 특수 훈련을 받은 런던 구급차 서비스 의사들도 화재현장에 출동했다. 런던 지하철 당국은 엗그웨어 로와 해머스미스 사이의 해머스미스와 시티 그리고 서클 노선이 화재로 인해 봉쇄됐다고 말했다. 경찰은 A40 웨슷웨이는 양방향 모두 봉쇄됐다고 했다. 채널 4의 놀라운 우주라는 프로그램 진행자인 조즈 클락이라는 목격자는 레디오 5 생중계에 “재를 뒤집어 쓰고 있는데, 상황이 이 정도로 안좋다는 얘기다”라고 했다. 켄싱튼 및 첼시 위원회에 따르면, 이 단지에는 124동의 아파트 및 연립 등이 있으며 화재가 난 것은 24층 짜리라고 했다. 2년간 1천만 파운드 상당의 재정비 작업을 해오다가 지난 해 완성된 것은 위원회를 대신 한 켄싱튼 및 첼시 임차인 관리기구(KCTMO)가 해온 일이었다. 이 재정비 작업에는 외장공사와 공동난방체제도 포함돼있었다. 현지의 그렌휄행동단체는, 재정비 작업이 진행되고 있었을 동안, 해당 아파트는 화재 위험이 있는 것으로 여겨졌고 주민들은 비상사태용 차량들이 작업현장에 다가가는 것을 엄격히 제한하라는 경고를 했었다고 주장했다. BBC는 화재가 발생한 때로부터 몇 시간 동안 이 건물 관리회사와 연락을 취할 수 없었다. 그는 “난 100m 떨어져 있었는데도 완전히 재를 뒤집어 썼다”고 했다. 조디 마틴은 화재를 보고 도우려고 현장으로 달려갔었다고 했다. 그는 자신이 사람들에게 “나가세요, 나가세요”하고 외쳤지만 주민들은 건물 복도가 연기로 꽉 차있어서 갇혀있다고 외쳤다고 말했다. 또다른 목격자 팀 다우니는 BBC에 건물 일부가 완전히 불에 소실돼 없어졌다고 했다. “불길은 건물의 딱 중앙부 한복판으로 타오르고 있다”고 했다. “건물 전체가 몽땅 불에 타 없어지고 있는 중이다"
A huge fire has raged through the night at a tower block in Latimer Road, west London, with eyewitnesses claiming people are trapped in their homes. The fire at Grenfell Tower on the Lancaster West Estate was reported at 00:54 BST and about 200 firefighters are still tackling the blaze. The Met Police said people were being treated for "a range of injuries". 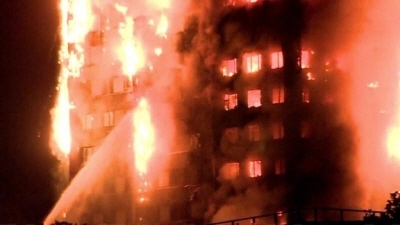 The BBC's Andy Moore said the whole tower block had been alight and there were fears the building might collapse. The tower block contains 120 flats and is 24 storeys high. Forty fire engines have been sent to the tower, and Mayor of London Sadiq Khan said a "major incident" had been declared. Others says residents - thought to be trapped inside - have been seen coming to their windows. London Fire Brigade assistant commissioner Dan Daly said firefighters were "working extremely hard in very difficult conditions to tackle this fire". London Underground said the Hammersmith and City and Circle lines have been closed between Edgware Road and Hammersmith because of the fire. Police said the A40 Westway was closed in both directions. One eyewitness, George Clarke, the presenter of Channel 4 TV programme Amazing Spaces, told Radio 5 Live: "I'm getting covered in ash, that's how bad it is." It is managed by the Kensington and Chelsea Tenant Management Organisation (KCTMO) on behalf of the council and had undergone a two-year, £10m refurbishment that was completed last year. The local Grenfell Action Group had claimed, while the refurbishment was ongoing, the block constituted a fire risk and residents had warned that access to the site for emergency vehicles was "severely restricted". The BBC has been unable to contact the property's management company in the hours since the fire. He added: "I'm 100 metres away and I'm absolutely covered in ash. "It's so heartbreaking, I've seen someone flashing their torches at the top level and they obviously can't get out." Jody Martin said he ran towards the building to try and help when he saw the fire. He said he was shouting at people to "get out, get out" but that residents were shouting back that they were stuck as corridors inside the building were filled with smoke. Tim Downie, another eyewitness, told the BBC part of the building was "completely burned away". "It has burned through to its very core," he said. "It looks very bad, very very bad. I've never seen anything like this. It's just such a big fire. "The whole building is just crumbling. It's just billowing black smoke." Safiyah, who is about 500m away from the building, said: "There are lots of people gathered in the street. I just see more and more flames burning and tragically I hear people crying for help. "The entire building is burning through."